When it comes to building functional and appealing eCommerce websites, the choice of the most suitable website builder proves to be a real challenge. This especially concerns the newbies, who lack information about the most popular web building platforms and their major characteristics. Weebly and Shopify are two website builders, which make it possible to launch and manage quality online stores. Weebly – is a renowned representative of the eCommerce web design niche, which has gained worldwide popularity due to the extensive choice of features, flexibility and reasonable pricing policy. The foundation of the platform dates back to 2006. Since that time, it has undergone serious transformations to become a worthy eCommerce web building tool. Shopify – is the world-known eCommerce software, which is currently considered the industry leader. The platform can boast an extensive and powerful feature set, high quality eCommerce templates, customization tools and numerous integrations. By using the service, you can effectively launch and manage small and large online stores, differing in their parameters and features. 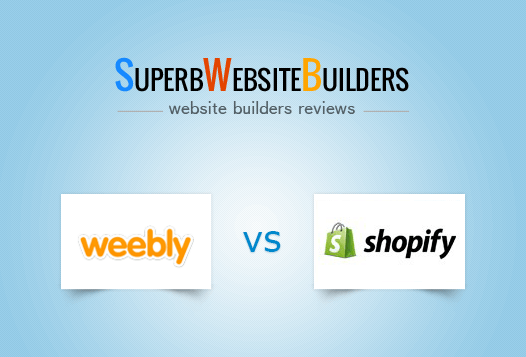 We decided to make this decision easier for you and prepared this Shopify vs Weebly comparison. We will focus on the major features of these website builders from an eCommerce point of view to show that both platforms are worth your attention. Let’s get started now. Weebly. With a detailed and informative startup guide, Weebly is a smart choice for those users, who are going to switch to this platform from another one. It comes with an understandable dashboard that ensures quick access to the information required, including website statistics, blog comments, store orders, useful tips etc. The highlight of the platform is that it uses a “box model”, which means that all the content you will add to the page falls into specific containers (boxes), when you drag and drop it to the page. Due to this approach, you won’t face problems when transferring the content you need from one theme to another. No coding skills or experience are needed to create a powerful eCommerce website with Weebly. Just select a theme that suits your business most of all and customize it to your liking. Choose between dozens of apps and widgets (such as slideshows, picture galleries, audios and video files, maps, search box etc.) that are easily integrated into any Weebly template. The number of elements you can add to the page is unlimited. Shopify. When it comes to Shopify, you just won’t be able to spoil something there. This is one of the features that make this website builder a nice choice for any user, irrespective of his/her web building experience and knowledge. Having registered with the platform, follow the guidelines to get through all the stages of the web building process with ease and convenience. Having adjusted all the required settings for your online store, you are welcome to enhance its design by using the Shopify Storefront Editor. It notably simplifies the process of building your online store by dividing the screen into two parts: the one, where you will make the changes and the one, where these changes will be reflected. Another Shopify benefit is that it comes with free iOS and Android applications that make it possible to manage your eCommerce site on the go. All the changes you make on your mobile device are automatically synchronized with your online store and Shopify POS. Weebly vs Shopify. In terms of usability, Weebly is a bit simpler than Shopify. There is no need to spend much time mastering the nuances of the web building process with this website builder. Just select a template and customize it with regard to your needs, making use of the intuitive interface and simple web design tools that are always at hand. Weebly. The website builder features the effective combination of flexibility and functionality. It comes with an extensive set of eCommerce features everyone can make use of to launch and then successfully manage a decent online store. The eCommerce focus of the website builder has become even more distinct after the acquisition of the system by Square in 2018. Weebly now offers multiple niche-specific features, such as integrated shopping cart, order and inventory tracking, flexible shipping options, inventory management, coupon codes, physical/digital goods, filtered product search, mobile store, simple and convenient product upload and management process etc. You can easily upload products from CSV files to speed up the catalogue compilation process. Weebly makes use of the IFTTT benefits, offering users a nice chance to connect different products and applications in order to develop automated events and tasks. That’s very convenient when it comes to promoting your products or services through the social networks or other resources. The system also offers a handy email marketing feature, which will help you notify customers about all the web store-related events, news, updates, special offers discounts and other important things. 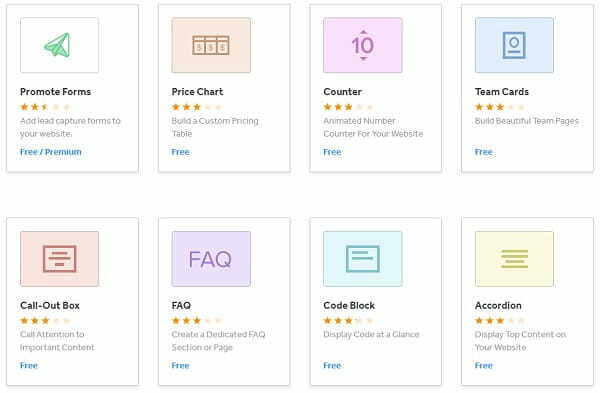 Weebly’s App Center is dynamically developing, offering a collection of services and applications, any of which can be integrated into your online store with a few clicks only. The apps that are used to create unique content, include Live Chat, PinPoll and Call-Out-Box to mention a few. Shopify. The eCommerce software definitely ranks high in terms of functionality. The website builder can be used both to develop and manage online stores as well as to sell products at your retail storefront. Regardless of the option selected, you won’t be disappointed with the flexibility and feature set offered. With the POS software, online store owners avail a number of benefits, such as an ability to use their external card terminals, create secure multiple staff accounts, accept orders in the offline mode, integrate with other Shopify software programs etc. These options allow for the enhanced business management. Shopify stands out from the crowd due to its extensive synchronization and integration options. The features make it possible to boost online store performance, making use of the functionality implied by the other systems. Thus, it is possible to synchronize your Shopify account with that on Amazon to expand customer base and increase the amount of sales. The same is about other popular external services like Xero, Quickbooks etc. To keep their clients engaged into the shopping process, Shopify have recently introduced the advanced Augmented Reality tool. It makes it possible for customers to view the products they are interested in from different angles. 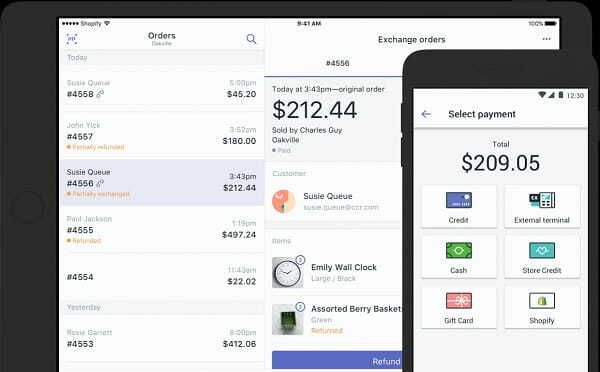 Safety and confidentiality of customers’ information and payments is another subject of Shopify concern. The developers of the system have undertaken special measures to safeguard each online store from unauthorized third-party access and fraudulent actions. To boost your website safety, you can make use of the recently-implemented Fraud Protection feature or connect the SSL Certificate to the online store. The software provides extensive multichannel support options. It has built partnership relations with social networks and other services, where you can effectively display and promote your physical and digital products. Weebly vs Shopify. Shopify is definitely a leader of the comparison. The system provides a powerful out-of-the-box feature set, extensive design customization tools, marketing options, customer engagement features, decent SEO adjustment parameters. It puts you in charge of the web store management and control process, which matters a lot for any conscientious entrepreneur. Weebly. In terms of design, Weebly offers 3 options depending upon the web building skills, experience and needs of users. Thus, one may use readymade templates, customize a theme chosen or create and integrate a personal template. As far as Weebly developers try their best effort to keep up with the time, the platform offers an extensive selection of new responsive templates that will make your eCommerce store well-optimized for mobile browsing. There is also an opportunity to upload your own template – either the one you have created yourself or the one you have purchased from third-party designers. This, however does not mean that you won’t be able to use old themes when creating mobile responsive eCommerce projects. With this purpose, Weebly has an integrated mobile editor that will give your online store mobile look and functionality. Regardless of the mode you are using when editing your website (a desktop or a mobile), all the changes are automatically synchronized. Shopify. The system provides a pretty nice selection of eCommerce templates. They are available in free and paid variants, with paid designs featuring better quality and deeper customization options. As of today, there are 10 free templates and 51 paid themes users can browse. The cost of paid designs starts from $140 depending upon the customization degree and design complexity implied. For the ease of search and time economy, the templates fall into thematic categories. It’s up to you to select the template you are interested in to further give it decent appeal, making use of design customization tools. Thus, Shopify uses the advanced Liquid tool to let you fully customize your online store. The tool will be a great solution for beginners and web design professionals, who have an idea to impress their business partners and clients. It unveils superior design customization experience, granting access to multiple tools, how-to guides, technical tips, Liquid language resources and more. Apart from integrated system templates, Shopify additionally makes it possible to choose the themes developed by popular designers like Pixel Union, Happy Cog and Clearleft (free and paid). If you have proper HTML/CSS editing skills, you can select the design you like and make it unique using your programming knowledge. Weebly vs Shopify. Speaking about the design aspect, Shopify proves to be a more preferable option. The system implies the opportunity to use code editing skills to create unique outstanding designs. It ensures immersive web design experience, granting access to multiple design customization options, high quality templates and advanced Liquid tools. Weebly. Users can avail different customer support services from Weebly. Whatever problem you encounter, you will surely get professional assistance provided by the Weebly team. Thus, you can make use of the valuable hints and pop-ups at the control panel, try phone/email/live chat assistance or get in touch with Weebly Help Center. It’s also possible to contact the customer support team of the service through the platform’s social network accounts in Facebook or Twitter. Shopify. The customer support options provided by the website builder are definitely worth the subscription investments. The platform has an informative forum with lots of topics, sections, tips, how-to guidelines etc. It’s also possible to get in touch with Shopify Guru via the Live Chat or email. For those users, who just with to hang around and have a talk, Shopify offers a separate off-topic forum section. What’s more, the software has its own YouTube channel with lots of educative system-related videos and tutorials. Shopify vs Weebly. Both Weebly and Shopify offer reliable customer support options, yet Shopify grants access to a greater variety of solutions. Users have a chance to get in touch with the customer support team of the service any time of the day, browse the how-to guides, get in touch with Shopify Guru, watch YouTube videos on the system’s channel and reach a spectacular community forum to find -answers to their questions. Weebly. When it comes to pricing, Weebly has different offers to suit any needs and budget. The platform offers a free unlimited plan and 4 paid plans (Starter, Pro, Business, Performance). If you choose a free version of the website builder, you won’t be bored with the system ads. Instead, there will be a small Weebly link found in the footer of your website. The cost of the paid plans starts with $8/mo for the cheapest ad-free Starter Plan and reaches $38/mo for the advanced Performance Plan, which works best for business owners. Shopify. The software makes it possible to test its powerful features during the 14-day trial period, which is granted at no cost at all. As soon as you are ready to upgrade for the paid plan and start working on your web store development, you’ll be able to choose between four paid subscriptions. They are: Light, Basic Shopify, Shopify and Advanced Shopify. The cost of the plans starts with $9/mo and reaches $299/mo. The difference between paid subscriptions is mostly about the tools and features they offer. The service grants the 14-day money back guarantee to all users, who are unsatisfied with the system or the terms it offers for some reason. Mind that Shopify charges commission fees for the financial transactions made in the system. The percentage depends upon the plan used. It generally ranges between 0.5% and 2%, but it may be reduced even to 0% on the advanced plan, depending upon the terms. Weebly vs Shopify. Weebly and Shopify offer nice pricing policies, which differ with regard to the needs, business goals and budgets of users. Shopify, however, has more extensive plans that cover the prevailing amount of users’ needs. The price range is quite extensive here as well, which lets users select the subscription that comes up to their budget most of all. So, what option should you eventually go for – Weebly or Shopify? This depends upon your business specialization and web building needs. The thing is that both platforms are full-featured, flexible and functional, but each of them is used to meet different requirements. While Weebly mostly focuses on the development of small and mid-sized online stores and offers more limited feature set to do that, Shopify grants access to the tremendous range of eCommerce features to launch small and medium web stores as well as hypermarkets. Having reviewed both systems, we can now conclude that Shopify is the top choice for entrepreneurs, who have long-term goals and powerful aspirations. Weebly is one of the oldest representatives of the eCommerce market, which is a nice choice for building small- and medium-sized online stores. The system is moderately-priced and this is what makes it popular with business owners. For just around $38/month, you will get a full-featured online store with a possibility to add the unlimited amount of products, absence of transaction fees, an opportunity to generate coupon codes and a built-in shopping cart on your own domain name. Shopify is the renowned and the most trusted eCommerce software, which can cover a broad spectrum of eCommerce web building needs. The system stands out from the crowd due to its distinct eCommerce focus, high quality templates, deep design customization tools and reasonable pricing policy. The platform is extremely flexible and this is what makes it a top solution for entrepreneurs, who intend to run a powerful online store with lots of niche-specific features and functions. That being said, your final choice should be based upon your current business needs and budget. If you are ready to invest into a powerful eCommerce project with flexible design settings, affordable pricing policy and impressive set of industry-specific features, then Shopify is definitely the platform to use.